“The Clovehitch Killer” could have been a sort of dumb comedy, and its tale of a 16 year old boy who begins to suspect that his father (the local Boy Scout troupe leader) is an infamous serial killer could have been exploited for cheap, if black-humored, laughs. But “The Clovehitch Killer” is a different kind of slow-burn horror film, one that entirely favors plot and character-development over gruesome murders, and which marks a very auspicious debut for first-time feature director Duncan Skiles. Charlie Plummer (“The Rider” and “All the Money in the World”) is Tyler Burnside, a good kid who’s concerned about his advancement in the Boy Scouts and whose worst trait is that he sneaks out to meet a girl from church. “Borrowing” his dad’s truck, he takes her to a parking lot, where he’s too shy to make the first move, beginning a chaste tryst that ends with the discovery of something in his Dad’s truck, something that doesn’t much impress the kids at church and which earns him a reputation for being a “perv”. But its not his truck, is it? It’s his dad’s, played by Dylan McDermott, and the nature of the found object is such that Tyler doesn’t feel comfortable asking his father about it. And then, small clues begin to pile up — what does Tyler’s dad do in his garden shed where, as his mother says, his dad “has his own hobbies?” Could it be that his father is connected in some way to the Clovehitch killer, the serial killer who terrorized his small town 10 years before? And what does the troubled local girl who is obsessed with the serial killer know? While that might sound like a pretty familiar setup for a horror film (and I guess it is — see Bob Balaban’s “Parents” for a more outright comedic take on the premise– what makes “The Clovehitch Killer” so well is an admirable sense of restraint. Though its subject matter is disturbing, the film doesn’t throw hardly any blood at you, favoring instead a slow-burn approach that emphasizes small textural details, like the lived-in feel of the film’s locations, and the clever double meanings behind the increasingly cat-and-mouse dialogue between Tyler and his dad. The film even pulls the neat trick of fracturing its narrative at one point, following the father first and then the son in a sequence which is genuinely thrilling, not the least for being honest-to-god clever. You should see this movie even if you’re not a devotee of horror. 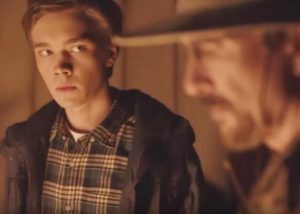 “The Clovehitch Killer” is a thriller worth enjoying for its strong performances and clever approach to what could have been overly-familiar material. Scout’s honor.